Red is a colour a girl cannot be without, nothing beats a simple red manicure. 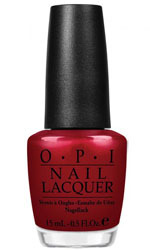 OPI has over 30 shades of red nail polish to choose from, best sellers include Big Apple Red and deep burgundy Malaga Wine, for passion, vitality and courage, release the vixen within and bring your outfit to life. Beware! The forest is dark, thick, foreboding and absolutely exhilarating. Infinite Shine formula. A bright shade of raspberry red. What a year, what a vintage, what a great colour. Does what it says on the bottle, and does it well. Big apple red with blue undertones. A flavoursome red with a hint of coral. Some candy, you will find, can be rather hot and spicy.